The October 17 banlist announcement came and went, and no changes were made to Modern. But that doesn’t mean there’s nothing to glean. Wizards dropped some juicy information this announcement, and today we’ll deduce which cards the company has their eye on unbanning. The competitive balances of all the major formats are in healthy places at this point, so we are making no changes. In the course of discussing options for this announcement, we did discuss unbanning in Modern. However, given the current healthy state of the format and the upcoming Modern Pro Tour, we plan to wait for the results of Pro Tour Rivals of Ixalan to evaluate any potential changes for the format. We anticipate making an announcement in February after the results from that tournament come in. Speaking of which, we do not anticipate making any changes to Modern with the January 15 announcement. We’re sensitive to the timing of that announcement relative to the Pro Tour, and only would make a change if it were very clearly needed. Given the current state of the format, we believe that will be extremely unlikely. Wizards considers this metagame “healthy.” That’s in line with my own assessment, and it provides a relatively solid benchmark with which to measure the health of future formats. Still, it would be nice to have more hard data to put to the “healthy” name. Wizards is considering Modern unbans. I think this is an exciting sign overall and applaud Wizards both for their restraint with this announcement and for keeping us in the loop. Wizards won’t ban anything until after the Pro Tour. The best news of the announcement, for a couple reasons. First, players spooked by community doomsaying can confidently invest in cards they were afraid of losing to the banlist (looking at you, Chalice of the Void). Second, it seems Wizards plans to make good on its promise not to use bans as a way to shake up the Pro Tour format, a strategy which led to enough public unrest for the company to suspend the Modern Pro Tour last time around. The banlist’s primary goal is to address format issues. Wizards bans cards in Modern for one of two reasons: offenders lower format diversity, or they violate the Turn-Four Rule. The only exceptions to this rule are cards that were banned from the format’s outset, because of a belief they would fall into one of those two categories (Mental Misstep, Jace, the Mind Sculptor, Chrome Mox, the artifact lands) and cards that make too many games go to time (Sensei’s Divining Top, Second Sunrise). It stands to reason, then, that if the format has no issues, nothing should be banned. Whether cards should be unbanned in such a scenario proves a divisive topic, with some arguing that healthy metagames should be milked with minimal interference, and others preferring a slimmer list or exciting new additions to the card pool. The latest announcement tells us Wizards is leaning toward the latter side of the debate. Wizards has always been conservative when it comes to unbanning cards in Modern, and Golgari Grave-Troll‘s brief reign of terror reveals why. Despite the occurrence of “successful” unbans, as when Bitterblossom and Ancestral Vision came off the banlist and did close to nothing, I think gaffes like the Troll unban are likely to scare Wizards into pushing the envelope even more cautiously. After all, the public backlash resulting from a hasty mistake naturally dwarfs that resulting from inaction during times of peace. In terms of format health, the name of the game when it comes to Modern management has always been diversity. That’s why the bulk of Modern bans have referenced metagame share and win percentage. If unbanning a card stands to increase diversity, the card becomes a potential unban candidate. Ranked likeliest to unlikeliest, here are the five cards I think have the best shot at being unbanned in Modern. My arguments for each card are based on their past performance and the current metagame, so it’s possible something deeply alters Modern in the next however-many months that influences the views presented here. Stoneforge Mystic has never been legal in Modern, and I’m interested in seeing what she can do. She certainly passes the level-one test of not fitting straight into an existing top-tier archetype. I hold my position from June that Stoneforge is safe for Modern. Modern Nexus’s own tests with the card cautioned against an unban, with David concluding in 2016 that the Kor mainly punished fair aggro decks (something he considers a net negative). But I’m not sure she still does. Death’s Shadow has driven many linear aggro-combo strategies out of the format, with only Affinity and Burn remaining to helm the archetype. That means fewer linear options that ignore Mystic altogether. As for fair aggro, the decks that exist and perform don’t want Stoneforge anyway. Those in Modern’s bottom rung might be able to actually use her. A speedy Batterskull puts in work against two of the format’s top decks, Eldrazi Tron and Grixis Shadow, and the card advantage Mystic provides shines in matchups traditionally more difficult for creature-based aggro strategies, such as Jeskai Tempo. Since these aggro decks make up a small portion of the metagame, a Stoneforge unban might make increase diversity by encouraging, say, Hatebear decks. I can also see Stoneforge buffing or nuancing other strategies, like BW Tokens, Abzan Rock, UW Control, and Jeskai Tempo. Unbanning Mystic doesn’t have many cons. I doubt she homogenizes midrange decks in the way Siege Rhino or Bloodbraid Elf have in the past, as nonwhite rock decks still offer tangible incentives (3-4 Ghost Quarter and solid mana for BG; red utility spells and Raging Ravine for Jund). As for the raw power level of cheating out Batterskull on turn three, I’m not sure it’s even on par with that of casting Thought-Knot Seer, Collected Company, or Shadow-Stubborn on that same turn. To top it off, Stoneforge is easier to kill now than ever thanks to Fatal Push, Collective Brutality, and of course Kolaghan’s Command. Another card to never have seen the light of Modern, Jace, the Mind Sculptor is one of the most polarizing cards on the banlist. Let’s again refer to David’s testing, which unsurprisingly found that Jace helps control decks beat fair decks and doesn’t help them beat unfair ones. While David argues the results signify a Jace unban making Modern less fair overall, it’s important to remember that Jace himself would exclusively see play in fair decks. It’s also relevant that the format’s best-performing fair deck, Grixis Shadow, is too strapped for mana to run Jace itself, suggesting that Jace’s arrival to Modern would in fact diversify blue midrange strategies. On to the card’s power: Jace, the Mind Sculptor is the best planeswalker ever printed. But he wouldn’t be the best one in Modern—Liliana of the Veil would keep that title. Modern is the most tempo-centric of all constructed Magic formats, which bodes badly for Jace. The blue walker hardly affects the board when he comes down, and resolves a full turn later than his sister-in-crime. Liliana also has utility in nearly every matchup, whether she’s removing threats against midrange or choking resources against combo. “Drawing more cards” is also powerful in every matchup, but Jace’s prohibitive costs—both his CMC and his double blue requirement—make him less attractive against many decks, especially of the combo variety (including aggro-combo and big mana). Even Jace’s color works against him; black, not blue, has the strongest tools for surviving to turn four. Consider tapping out for Jace against each of Modern’s top decks. Shadow can Stubborn Denial him; Jeskai can Logic Knot him; Eldrazi can resolve Reality Smasher and kill him; Tron can stick Karn and exile him; Company can chain a couple copies of its namesake and go off; Valakut, Storm, Burn, and Affinity can outright kill you. The only currently-performing deck I’d want to cast Jace against is BGx Rock, which isn’t even performing very well. As an aside, I’ve seen people suggest unbanning Jace and Bloodbraid Elf together. I think this suggestion is a little silly. For starters, the latter does not do a particularly great job of policing the former. But the implications of recklessly unbanning two untested bombs at once are massive. Speaking of Bloodbraid Elf, here’s a card David took a hard no on. Granted, that too was in 2016, when Jund was a top-tier competitor. Nowadays, Jund is far from advantaged in the way it used to be. Red’s wealth of utility spells (Bolt, Grudge, Command) doesn’t seem worth trading away the flexibility of Path to Exile and Lingering Souls, making Abzan the BGx Rock deck of choice for many Modern players—that is, when BGx Rock is played at all. The consensus is that the higher-reversability Grixis Shadow has functionally replaced these decks in the metagame. Bloodbraid Elf is impactful enough that I would expect Jund to immediately bounce back if it were unbanned. That’s reason enough to be wary of the card, as Jund has dominated Modern for, well, ever; I don’t know about you, but I’m happy with BGx Rock being a Tier 2 option for once. With that said, I doubt Elf-wielding Jund boasts a better matchup spread than Grixis Shadow does, and even with Elf, it doesn’t just start beating Eldrazi Tron and other big mana decks with any semblance of consistency. The first problem with an Elf unban is that it challenges Standard cards to hit a higher bar to see play in Modern. Tireless Tracker, Kalitas, Traitor of Ghet, Grim Flayer, and other creatures have gradually trickled into BGx Rock decks from new expansions since Elf’s banning. I would expect that trend to slow to a crawl with Elf available as a frequently superior option to anything reasonable to print in Standard, which undermines Wizards’s goals for Modern. Jace, the Mind Sculptor kind of runs into this problem too, but playable blue planeswalkers are rare enough in Modern to make that more of a corner case. Creatures, however, are plentiful, and most Modern shake-ups come from new midrange creatures entering the format. A second problem lies with fairness: not the convoluted fair-unfair Magic theory continuum, but the more traditional sense of the word. Jund sat atop Modern for years while Ancestral Vision, Sword of the Meek, and Bitterblossom, cards that represented a chance to help struggling lower-tier strategies, rotted forgotten on the banlist. Why should Jund get its favorite toy back as soon as it’s relegated to Tier 2? No one deck “deserves” to be Tier 1 in every metagame. On the surface, this fairness argument has little to do with Wizards’s vision of the format. But I think it can be linked to the company’s conservatism with unbans. If they’re that scared to let off Wild Nacatl, what are Bloodbraid Elf‘s odds? Ah, the actual most polarizing card on the banlist. It seems to me that players who want Splinter Twin back don’t understand how the deck warped Modern during its legality. But Modern has changed, as it always does, and the card’s as deserving of a second look as any. Modern is stronger now, making Twin relatively weaker than it was while legal. Death’s Shadow and Thought-Knot Seer in particular seem to line up very well against Twin. Fatal Push has also graced the format, giving black mages a cheaper option than Terminate and Abrupt Decay to hold up mana for—representing two mana each turn was devastating for BGx rock decks in the matchup. But Push still prevents players from cracking their fetchland. And that’s just the first and smallest of many strikes against Splinter Twin. Answering this question in depth illuminates Twin’s many strengths, especially considering Storm is currently one of the best-performing decks in Modern. Without a mana bear, Storm is a turn-five or -six combo deck. With one, it’s a turn-three or -four combo deck. But the bears can often be killed on an opponent’s main phase. Twin forces players to run instant-speed creature interaction, and it always threatens a kill once it has three lands. Twin has a solid Plan B—an aggro-control plan in fact so solid, it’s secretly the deck’s Plan A. Contrarily, Storm cannot attack from multiple angles. Storm folds to graveyard hate. Besides finding and casting Echoing Truth without exiling too many resources, the deck’s out to a Rest in Peace is to resolve a big Empty the Warrens. This plan gives opponents time to draw a sweeper or just win on their own terms. For its part, the Twin combo does not use the graveyard at all, allowing the deck to gracefully toe the fine line between using the powerful graveyard tools at its disposal and becoming overly reliant on them. Twin is harder to hate out than Storm for other reasons—in addition to graveyard hate, cards like Thalia, Guardian of Thraben, Chalice of the Void, Eidolon of Rhetoric, and Eidolon of the Great Revel all greatly hinder the deck. Anti-Splinter Twin hosers (i.e. Torpor Orb, Illness in the Ranks) tend to be more narrow and less splashable, and fail to address Twin’s primary fair gameplan in the first place. UR Twin was banned in part for homogenizing URx decks. Grixis Shadow and Jeskai Tempo prove Storm does not commit the same crime. Twin’s two biggest offenses are how it hinders turn-three plays and abuses the Turn-Four Rule. Cards like Tireless Tracker, Course of Kruphix, and Geist of Saint Traft would go the way of the dodo if Twin were legal, as slamming them on-curve necessitates that pilots relinquish their interaction mana on Twin’s combo turn. I’m also of the opinion that decks with a consistent turn-four combo have no business also being premier fair decks. Why play any aggro-combo, aggro-control, or combo-control deck when you could play Twin instead? Company would prove the biggest loser if Twin came back, as it functions as a worse version of midrange-plus-combo, loves tapping out for three-drops, and runs limited removal. Losing Company ensures a significant net diversity loss, as Collected Company helms multiple decks, including Bant Humans, Four-Color Humans, Bant Spirits, Slivers, Elves, Naya Company, Abzan Company, Kiki-Chord, and Counters Company. Much of what I wrote when Twin was banned is still true today, and Twin coming off the list would surely shake Modern to its core. Given that Wizards likes where the format is at right now, there’s no way Twin comes off any time soon. Serum Visions is one of the most played cards in Modern, and for good reason—it rocks! While Preordain fulfills a slightly different function; it’s a strict upgrade to the already-played Sleight of Hand, and miles better than Opt. Never mind that it slots right into the format’s leading fair deck; unbanning Preordain would at least kill cantrip diversity. I touted Preordain as a possible solution to the broken Dredge-Infect metagame last year. But without those decks at full power, the format looks a lot more reasonable, and I don’t think releasing this busted cantrip will do anybody any favors. Wizards will continue banning degenerate decks as they emerge, rather than try to unban cards of similar power level to combat them with, and let Modern’s power level steadily rise over time. Doing so allows cards to cross over from Standard. Of course, it’s theoretically possible Modern eventually reaches a power level where Preordain is fine. That stage would likely involve Serum Visions becoming unplayable, since if there’s a top-tier Serum Visions deck, Preordain is bound to stay on the banlist regardless. But considering Wizards is done printing efficient blue filtering in Standard, and that sort of effect will always have a home in any constructed format, I wouldn’t count on Visions ever being unplayable in Modern. Regardless of how strong Preordain is in a vacuum, it’s stuck on the banlist for good. Outside of these five cards, I don’t think it’s responsible to entertain arguments for anything else on the Modern banlist to come off. Those I’ve heard in favor of some of the other cards vary from suggesting unprecedented and unjustified “swap bans” (i.e. artifact lands for Cranial Plating) to helping control become a Tier 1 strategy for no apparent reason (i.e. “free Sensei’s Divining Top so we can play Miracles!”) to betraying a gross misunderstanding of a particular card’s warping effects (i.e. Umezawa’s Jitte; Punishing Fire). My stance on this last point might change as Modern evolves. For instance, I can see Seething Song coming off in a Modern that has banned Past in Flames and perhaps even Manamorphose for future offenses (both cards, to be absolutely clear, are completely safe at this stage). In any case, right now I couldn’t be happier with Wizards’s management of Modern and with the format as a whole. Do you agree or disagree with my banlist takes? Let me know in the comments! 1. Stoneforge: I definitely agree this is the most reasonable candidate for an unban, as Abzan and Hatebears aren’t exactly tearing things up right now. It’s probably enough to bring one or both of these decks into Tier 1 territory, but that doesn’t scare me too much, especially with Fatal Push as an obvious answer. 2. Jace: I do worry about a control deck like UW Control getting a hold of this and tearing things up. UW Control is doing pretty well right now, and I worry that a Jace unban would convince enough people to start playing the deck well enough that it emerges as a top contender. With that said, it’s been a really long time since UW Control has been a true top contender, so maybe it’s worth an experiment to see how it goes. But I am a little nervous. 3. Bloodbraid Elf: The best that can be said about a Bloodbraid un-ban is that it probably wouldn’t destroy the format like it would have when Jund was reliably a Tier 1 deck. But I agree that we don’t need to create a world where bgx is ALWAYS tier 1. It’s not a particularly interesting or fun deck to play or play against, in my experience. 4. Twin: Agreed. Twin would shake things up insanely, and I worry about it having access to some new tasty blue tools, like Opt. Or even delving into a Grixis Build for Fatal Push. Really, the only big reason I’d support a Twin unban would be so Merfolk could shine again, but I don’t think it would be particularly good for the format overall. 5. Perordain: I think Wizards sent a message when they printer Opt in Standard, namely that there’s a limit to the power level of cantrips they will print these days. We should be happy enough to have Opt to play around with as a new toy instead of asking for the far more powerful Preordain. I’m pretty much 100% with you on this. I’m really hoping for an SFM unban in February, I think she opens up loads of exciting possibilities that would spice up the format without breaking it. Only surprise here is that BBE wasnt at the top of the safe unbans list. The card would be lucky to even see play let alone impact the format in a meaningful way. How many BBE do you want with your dark confidants? Are you sure you want it over kalitas? Wait, are you sure you want it at all? All your visions of cascading into lilianas and k-commands thwarted when you realize a deck jammed full of 3 and 4 mana spells isnt very good, and when you still elf into an inquisition or target-less fatal push half the time anyways. Elf is no better than collected company, and is probably worse (if nothing else its a stricter mana requirement). You say Jace is ok because there arent other blue walkers then turn the table on BBE – where are all these red/green creatures that BBE is going to push out of modern? Ruric Thar? Boggart Ram Gang? I also thought you might go with dark horse Dig Through Time. While its not an “original ban” it has that bloodbraid thing going on where it died for another cards sins (treasure cruise). We don’t actually know how good dig would be because at the time it was dwarfed by treasure cruise. THe theory was everyone would just run dig and we’d be making an emergency ban to fix the same problem, but its theory – we dont actually know if that would have happened. Dig has tension with logic knot and tasigur, is not a slam dunk for storm (may even be unplayable) and twin is gone. Who’s abusing this card now? UW control by dropping logic knot? Or is Temur scapeshift back on the map (currently tier 3?). I do agree with SFM though and hope that’s whats coming. My fear is it will actually be bloodbraid and that it’ll end up being a meh low-impact change along the lines of bitterblossom and sword of the meek. BBE’s just a very powerful, very generic, all-purpose card-advantage creature that also gives Jund an aspect it lacks: haste. I’m convinced that it would run BBE right away over the myriad of flex spots that generally house a tickling variety of 3- and 4-drop slots. I mean I guess its all speculation but the fact siege rhino, collected company, and thought knot seer exist without even delving into things like Kalitas and chandra torch of defiance that jund actually plays in the 4 slot makes BBE look laughably tame. From what I have seen people have moved back onto dark confidant instead of grim flayer and that limits how many 4s you want in your deck. Abzan used to avoid bob like the plague just because of lingering souls and siege rhino – a jund with a set of BBEs is even worse, at least rhino gave you back 3 of the 4 life you lost. 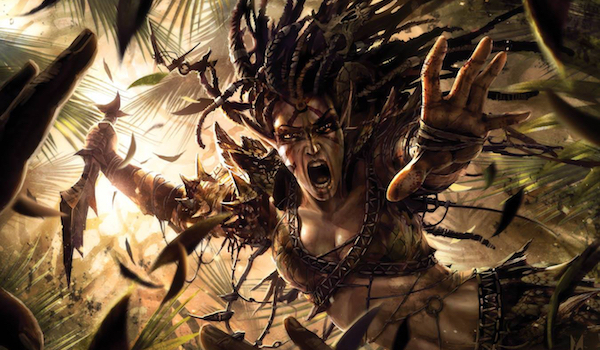 Jund decks were running Bob alongside BBE prior to the banning. Heck, I remember a time when a pro ran Hit // Run with Bob at a GP. The damage just isn’t that relevant compared to the extra cards you get. Jund wants to swamp you with cards and Bob and BBE are the best options. I agree that Jund would run BBE if unbaned. But that is no reason to place it in the “pessimistic about unban” zone…at least not in an objective, non-biased aproach. As previously stated, it is in no way better than collected company and would slot in TIER 3 decks. No one said that BGx should be tier 1 (and sincerly, Jund won’t be tier 1 even with BBE) but a BBE unbann could help other strategies that always needed a little bump to become viable. I’m thinking about a Temur Midrange deck, for example. Also, keep in mind that, more than BBE, a SFM unban would slot into BGx on the spot. Actually, Junk would probably run 4 SFM alongside a couple of Batterskulls on the spot. So what’s more scary? Turn 4 “whatever comes from the top” or a turn 3 Batterskull? But I still think SFM should be unbaned. About JtMS, I also think it’s a safe card to unban but it may be keeped on the list, given the fact that it would fit in an already TIER 1 deck. So, in my opinion, the best candidates for february are BBE and SFM, in this order, followed at some distance by JtMS. @Dragos: Perhaps you are not pessimistic about BBE’s chances, but I am, which is why I wrote that I am pessimistic about its chances. This is an opinion piece, after all! I never claimed to be “objective” or “non-biased,” as I don’t believe engaging in banlist discussion that way is even possible. Except it’s not “even worse” because Jund played 4 of each card for years and was good enough to earn multiple bans. There’s a precedent for it being very powerful. I agree with that, @Jordan! However, I hope in a BBE unban soon and I am looking forward to read your article on a Temur deck brew, using BBE, if you’ll decide to write one! Keep up the good work! I stumbled upon some articles/comments which stated that blazing shoal could be a safe ban. While I think it could be unbanned only if everyone at wizards became mad, I’d like to ear other comments. It may not be the thing that brings Infect back from the dead, but it has no business in Modern. Turn two “Oops, you lose” is not good gameplay. Yes, I know Grishoalbrand can do that too, but it also fizzles sometimes. Shoal doesn’t. Become Immense was already controversial, and Shoal requires less setup. Nothing positive could come from its return. As much as I’m personally against such notions of “good” and “bad” gameplay, this. Wizards doesn’t want to unban a card whose sole purpose is enabling a deck that tries to break its rules. It’s just risk for no reason. Same sort of deal with Hypergenesis, although I tend to think this card is garbage—it just exists to create non-games that functionally end on turn two or three, which is the opposite of what Modern strives to do. These card are obviously less powerful and warping than others on the banlist, but they don’t have a future in Modern. The problem with blazing shoal is greater gargadon and bedlam reveler which are both reasonably playable modern cards with huge cmc for shoal. Reveler in particular plays so well with it, im not sure we want to see burn or prowess variants with two free boros charms in their opening hands (ti swing gob guide shoal a reveler). Its not like shoaling a rift bolt is terrible in a pinch or even hardcasting it for two and a swiftspear trigger. Used to think it was no worse than become immense but its scary what could happen with free 8 or 10 dmg to the face with no setup required in an aggro deck. I’ll see it when I believe it. Dragonstorm is a zero in No Banlist Modern and I doubt it would be good here. I think Song’s primary application if the Storm cards were gone would be in All-In Red variants, which haven’t seen Modern play since the card was banned (turn-two Deus of Calamity here we go!). To reinforce what I said in the article, though, I don’t think we’re anywhere close to a Song unban. I was just using the card as an example of an unlikely predicament that might change my mind about Wizards not touching the other cards on the banlist. I would imagine they could swap grapeshot and simian spirit guide for seething song and preordain and modern would be a better format for it. I agree with your article in the whole and really enjoyed reading it. Thanks! I think you may have missed a trick regarding bloodbraid elf, insofar as you make a couple of assertions which don’t ring true, and they underpin your argument. First; the banning of elf was a “what card is jund playing that no other deck is playing” ban rather than a “this is too good” ban. Second; the banning of elf didn’t actually hurt the deck or reduce its meta share. The impact of the elf in jund was effectively neutral, and there’s no logical reason to assume that the effect would be any different now. Other curve-toppers in jund perform an equivalent duty in the deck I.e. Card advantage. The deck needs something in the 60 to tap out for that provides more than one card’s worth of effect, whether it’s the recently tested goblin rabblemaster (which I think is a nice inclusion) or Kalitas, which was (for a very long time) Played alongside a singleton Seal of Fire to gain immediate effect from the zombie ability (not to mention the useful exile clause). Jund even flaunted with Huntmaster of the Fells. Elf doesn’t do anything particularly different to these advantage-driven three and four drops, it just has a different way of going about it. In short the card was never too good, its ban was made with good intentions but didn’t have the desired effect, Elf constitutes a neutral utilitarian addition to the deck rather than a “powering up”, and the fact that it’s still on the banlist is kind of a joke. I’m honestly surprised you see it as any kind of risk at all. The reason Jund was still the best after the Bloodbraid ban is because the deck was so far ahead of everyone else it could afford to lose a core component (Elf was a staple at 4 in every Jund deck). Sure, DRS was a more direct offender, but I think just banning the Shaman would have yielded a similar result. Jund was just an insane deck at that time and needed a significant nerf for Modern to meet Wizards’s diversity standards. After all, the deck remained Tier 1 after both of those bans until Shadow came around (barring hiccups like Eldrazi Winter or the Rhino-fueled month of Abzan). I think the fact that Elf is just a little bit more reliable and better in more situations than the other four-drops available to Jund is reason enough to scrutinize it more carefully considering the deck dominated the format for so long. As I said in the article, I’m not super optimistic about an Elf unban, but I can see the card coming off. I’m just more medium on Elf than I am on Jace or SFM. It definitely works in Elf’s favor that Jund was the only deck playing it, which is a great point. Thanks for the comment. I think you’re just biased on the BBE topic. You acknowledge that nothing changed after the banning of BBE because Jund could lose BBE but then don’t acknowledge the massive fall in metagame percentage after DRS finally gets banned. Hmm, maybe Jund could survive the banning of BBE unscathed because BBE was never the real problem? I mean, Jund was fine with BBE before DRS showed up and was fine after but it must have been BBE that was the problem – not because, as the ban announcement suggests: “We wanted a card that top players consistently played four copies of in Jund, but ideally was less played in other top Modern decks”. The deck already exists, google it. Except it doesn’t run unplayable creatures like Brawler. I pretty much agree with everything except for your Storm/Twin comparisons. 1. Storm is also very capable of playing their bear on turn 3 and killing you if you don’t have instant speed removal. You aren’t always going to get a turn to use sorcery speed spells to get rid of them. In these cases, Storm is violating the turn 4 rule for Modern, while Twin can not possibly kill before turn 4. 2. Storm does attack from different angles. Storming into a Grapeshot is plan A, Empty is plan B, locking your opponent down with Blood Moon is another angle, and a strategy that some Storm players use against GDS in particular is to board out their bears and board in Bolts, and try to kill the GDS player with a flurry of Bolts and a small Grapeshot after the GDS player has already dealt themselves damage. 3. Storm can still kill through graveyard hate, it just makes it harder. As for Twin, it’s true that the combo doesn’t rely on the graveyard, but the deck itself still used it. Snapcaster Mage is the best card in the deck, and the Grixis versions ran delve threats. Graveyard hate definitely would hurt Twin, it just didn’t shut it down. 4. You’re making a fundamental mistake with this argument. The Storm mechanic itself is difficult to interact with, so you have to use some kind of hoser to stop Storm. You never were required to use a Twin hoser like Torpor Orb to win against them. All you needed was instant speed creature or enchantment removal, something that just about every deck runs in some numbers in their 75 anyway. Now, you could improve your odds against them by siding cards like Torpor Orb or Rending Volley, but it wasn’t required to win games against them. 5. And this argument has been proven false over time. Twin didn’t homogenize URx decks because it was the best one, it did so because it was the only viable URx deck at the time. Banning Twin didn’t just suddenly open up the floodgates on blue decks, they were all unplayable. So, people just stopped playing blue decks. It wasn’t until Grixis Shadow emerged as a legit top tier deck that blue became playable again. The meta shift that GDS caused also brought Jeskai Tempo back into good standing, that and the printing of some new cards like Spell Queller. If Twin were unbanned right now, I could gaurantee that Grixis Shadow and some Jeskai shell with Queller would still be played and see success. The turn 4 rule is binary. It’s either a yes or a no. There is no, “Well, the deck never kills before turn 4, but it kills on turn 4 too frequently, so it’s abusing the turn 4 rule.” Twin never killed before turn 4. It’s a straight 0 on the turn 4 warning meter. I can understand all those points, but in each instance, Twin has the upper hand over Storm. I think those advantages are enough to add up to a deck that might be too good, esp. considering how well Storm is performing right now. At the end of the day, though, Wizards likes diversity, and Modern is very diverse right now. They last thing they are going to want to do is unban a card that is sure to shake things up significantly. Basically, having a deck that reliably combos on T4 while also interacting serviceably on turns 1-3 invalidates all other combo decks unless they themselves violate the T4 rule (and will therefore be banned). In this way, Twin cannibalizes not just diversity among URx decks (debatable, as you pointed out) but among combo decks in general. A banlist discussion featuring Twin?